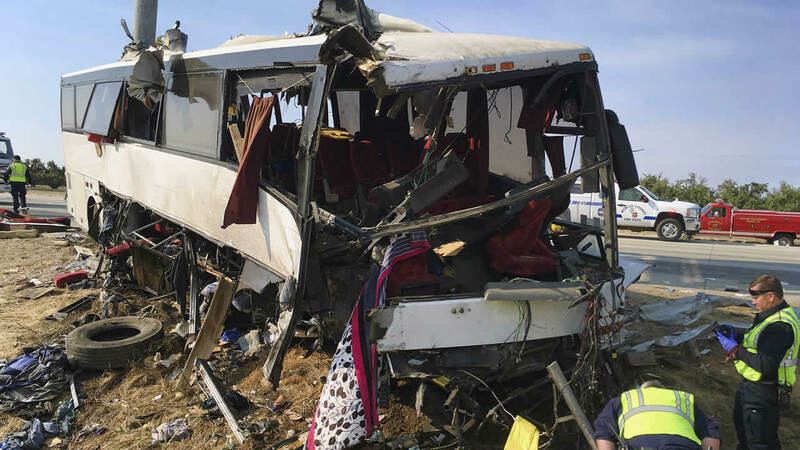 LIVINGSTON, Calif. -- Federal safety investigators converged Wednesday in central California to investigate a highway wreck that nearly sliced a bus in half, killed four people and injured 23. "At this point we don't know what occurred immediately before the crash," said Don Karol, a senior highway accident investigator for the NTSB. "We're going to be working with the California Highway Patrol to determine that." Officials said there were 27 people, including the driver, aboard the bus when it struck a large sign post amid San Joaquin Valley farmland shortly before 3:30 a.m. Tuesday. Of the survivors, seven suffered major injuries, three had moderate injuries and 13 received minor injuries. The CHP initially reported five deaths but Merced County Sheriff Vern Warnke lowered the number to four after canvassing hospitals and the coroner's office in an adjacent county. "It was chaotic," CHP Capt. Brian Hawkins said of the miscount. "There was a lot going on." Karol said NTSB investigators would likely spend five to seven days at the scene. They span disciplines including human factors, vehicle factors, issues related to the bus company, such as its safety culture, and accident reconstruction, Karol said. Such NTSB investigations last months before a probable cause is determined. "This was a horrific crash," Karol said. The dead include Fernando Ramirez, 57, and Petra Carillo Ruiz, 64, a married couple from Mexico who were traveling to visit a daughter in Pasco, Washington, and Jose Morales Bravo, 58, of Avalon, California, whose spouse was hospitalized, Warnke said. A fourth victim was identified as Jaime De Los Santos, 38, of Tijuana, Mexico. The family of one of the men killed in the crash describe him as a devoted father of four. Eva Maria Morales wept as she talked about her father, Jose Morales Bravo. "He was a good father," she said in Spanish from her home on Santa Catalina Island, off the Los Angeles coast. "He loved being with his children." She said her parents made sure to visit all their children at least once a year and had most recently left Catalina for Washington state, where two of them live. Her mother also was injured in the crash and was expected to survive, although she's emotionally devastated, Morales said. The crash split the bus down the middle when it hit the large metal post holding an exit sign. Warnke has said rescuers pulled "bags of body parts" from the bus along with survivors, some of whom suffered severed limbs. Moments before the crash, it appeared the driver was trying to pass another vehicle that he apparently expected to yield, but it would not let him merge, said a passenger headed from Mexico to her home in Pasco. "It kind of ran him off the road," Nakia Coleman told Washington state's Tri-City Herald newspaper. Investigators have not been able to interview the 57-year-old driver, Mario David Vasquez of the Los Angeles area, because of the extent of his injuries, CHP Officer Moises Onsurez said. The bus was traveling north on State Route 99, through the center of California farm country, and was only a couple of miles from its next stop when the crash occurred. It was approaching Livingston, a farming and industrial town of about 13,000, where it was scheduled to change drivers before continuing on to the Northwest. Passenger Leonardo Sanchez was sleeping peacefully before dawn on the bus carrying him to Oregon to pick blueberries when he was suddenly thrown face-first into the back of the seat in front of him. He said only about eight people, including himself, escaped largely unscathed. "We couldn't pull people out because there was shattered glass everywhere, seats destroyed," Sanchez said. Some victims were thrown from the bus into a ditch. Autobuses Coordinados USA was operating the bus. Calls to various telephone listings for the company have gone unanswered. A woman who answered the phone at the company's Fresno office on Wednesday said the owner was busy and couldn't talk. Its counter at a Los Angeles depot was open Tuesday, but nobody was present when an Associated Press reporter arrived midmorning. A sign in Spanish advertised daily 7:30 p.m. departures to destinations up the West Coast to Washington. The Federal Motor Carrier Safety Administration listed the carrier as having a "satisfactory" rating as of May 17. The bus was inspected in April and had three violations, including a lack of or a defective brake warning device.